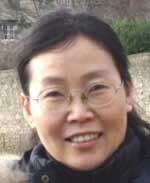 These questions are from Di Aiying, a Chinese graduate student working on her PhD in translation theory at Manchester University. We answer them here, as interesting in themselves, and as somewhat representative of other questions received over the years. Q: Since translation is basically interpretation, what is your interpretive perspective? A: We don't regard interpretation as part of the job of translation. We think it is something separate: the adjustment of the text to the needs or interests of modern readers. Interpretation may be dealt with in a preface or a commentary, but in our view it shouldn't intrude on the translation itself. We distinguish the text from some sermon based on the text. Q: Is your perspective also historical, as your research on the textual and chronological compilation of Lun Yu and other literature of the Warring States? A: We consider it our job to get back at the text on its own terms, and to present the message which the text itself sought to present to its original audience. Its value for modern audiences, if any, needs to be addressed separately; otherwise, one comes out with an adaptation rather than a translation. And this is not true only of ancient works, where the temptation to adapt to a very different readership can be great. The same principle would apply to the translation of a contemporary Chinese novel. One would need to be very familiar with the currents of modern literature in general, and with the situation of that writer in particular. And it is worth mentioning that knowing our own time is not necessarily easier than knowing a past time. Both require a major effort of acquaintance, not only with the things that concern us, the readership, as modern persons, but with the things that concern modern persons in other places and social contexts; the ones from which the novel itself comes. We don't see a difference between the two situations. All translations should be adequate to the historical background of the text, whether that background is ancient or modern. We see an obligation of familiarity in both cases. And when the background is known, we see an obligation to have the translation speak as from that background. Q: Roger Ames and Henry Rosemont state very clearly that their translation of Lun Yu is a philosophical interpretation. Therefore, they give priority to the accuracy of philosophical meanings rather than the elegance of words and expressions. A: A translation needs to get the technical terms right. If there is a constellation in the text (as there is in LY 2:1, see our p109), it should be correctly identified in the translation. If there is a musical direction (as there is in LY 3:23, see our p85), then a musician should be able to tell what is going on by reading the translation. And if there is a philosophical term, it too should be rendered with the correct counterpart term, or its technical nature should be otherwise signaled in the translation. But this kind of accuracy does not conflict with the appropriate rendering of the style of the original. So in our opinion, the choice you refer to really doesn't need to be made: both options should be chosen. Thus in a Buddhist sutra, it can happen that there are many exact repetitions of a particular passage. It is important to render that passage correctly the first time, in order to convey the doctrinal content. This is the accuracy part. But it is also important to repeat that passage in full, each time it recurs, because the exact repetition, however tedious to a modern reader, is very much part of the presentation mode of the text. So also with an endlessly recursive African folk tale. This is the style part, and the style is part of the message; in the African case, it is about 90% of the message. To eliminate that dimension may give a helpful summary, for some purposes, but it's wrong to call it a translation. I heard the tale of Mukuyakalangi as told by a folklorist while driving, in snow, from Cornell to Harvard. It took the better part of an hour. That performance might seem unwieldy if reduced to paper, but that is not a question of translation theory; it is just a question of housekeeping. Things have their own presentation mode; their own scale. If you walk out of Tristan after five minutes, saying "I get the idea," have you in fact gotten the idea? We would have to doubt it. There is more here than the issue of "elegance;" there is an issue of correct scale. As for "philosophical," there is also a contrast between a text which is of philosophical interest to its readers (as are most of the Warring States texts, in one way or another), and a philosophical text proper: a text which addresses its hearers in a consciously philosophical way; a text which Oxford University Press would list in its Philosophy catalogue. Very few Warring States texts qualify as "philosophical" in the latter sense. The concept of philosophical consistency, of ideas as forming, not just a cluster, but a system, did not exist in the first part of the period covered by the Analects. It did come to exist in the second part of that period. In fact, we can see exactly where that concept first arose in the consciousness of the Analects writers; it was in the passage LY *15:24 and its parallel, the also interpolated passage *4:15. Both these passages are from the very end of the 04th century. In them, "Confucius" is made to claim that he is not just delivering a lot of scattered ad hoc gnomic wisdom; rather, his teachings are permanently applicable, and he has "one thread that ties them all together." This notion of permanency and coherence is something dazzlingly new in the Chinese world of that time. It turns up, in somewhat different form, in several other texts of the late 04th century and subsequently, but not before that. It coincides with the Chinese discovery of history: the idea that the stream of events has some larger meaning and tendency. There is a large awakening, at just this time, to system in all its senses, including the cosmological. This being the case, to treat the Analects as a philosophical treatise before that moment is a serious error. And to treat it as a philosophical treatise after that moment may also be open to doubt: the Confucian school of Lu (the proprietors and extenders of the Analects text) didn't consistently maintain that level of systematic consciousness once they had reached it. The end of the text, its last five chapters, are precisely the part which, as Tswei Shu long ago pointed out, is relatively disorganized compared to the earlier material. 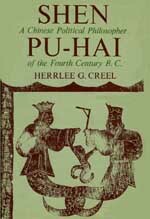 It was largely left to rival schools of 03c thought (some of which were Confucian by derivation) to build up what we can more readily recognize as philosophical systems. The Analects tends to resist that treatment. Q: How do you define the function of your translation? Does it only serve as a way to demonstrate your Accretion theory and your historical research findings? In other words, translation itself is not your focus. A: Translation is our focus while we are translating: we try to render the original as precisely as possible for modern readers in the English language, and we don't have anything else in mind at that point. We don't do the translation to illustrate our chronology of the text; rather, we do the chronology in order to provide sufficient understanding of the text to embark on its translation. This applies to all the texts we work on, translations of some of which are in the pipeline now, for future publication. But our understanding of the background does make a difference in our understanding of the text in the foreground. With the Analects, our previous research warns us that the text is not a unity; rather, it accumulated over time. This is important for the translator to know, since in an accumulative text, a text with a time depth, we cannot expect that terms will hold a constant meaning throughout. The same word may mean different things in the 05th century and in the 04th century. One example is the virtue rvn, which had an individual meaning for Confucius (in LY 4, c0479) but a distinctly social meaning for his successors in LY 12-13 (c0325-0322). As it also did for Mencius, who began his public career in exactly this period, in the year 0320. The similarity of ideology is not an accident. The Analects, as of LY 12-13, and the Mencius, as of the first interviews of Mencius (see our p97), are coming out of the same point in the timestream. They do not relate as master and successor, but as neighbors, indeed colleagues, in the vicinity of the year 0320. So also with the term jywndz, which (rather like one possible English equivalent, "gentleman") is social in the early Analects, but tends to acquire a moral dimension in the middle and later Analects (I think it is to the credit of Legge to have noticed this). In these and other cases, to force either meaning into the other would be to make a mess of both. The change in the actual meaning of the terms, and the shift in the position of the text as reflected in those changes, need to be respected in the translation. The history of the text is one more fact about the cultural setting of the text that the translator needs to get right. Q: How do you define your target readership? It seems that you intend to include both specialists and generalists, as can be seen from your preface. But in many ways, I suspect, you seem to be addressing only to specialists with all the detailed commentaries, arguments, and supporting materials. A: The wonderful thing about detailed commentaries, arguments, and supporting materials is that the novice reader can ignore them, and just encounter the text. In a Chinese traditional book, the commentary is printed or written smaller. In our book too, which is rather traditional in form, the text is printed in larger type to make the separation obvious. Our book is indeed a two-layer presentation, and the layers are distinguished by typography and placement. A third layer of commentary, the argument for the nature of the text and the life of Confucius, is put at the back of the book, and not mixed in with the translated Analects sayings, but the commentary proper, the thing available for momentary guidance, is in a handy place, so that the reader who is puzzled by the translation can dip down half an inch into the commentary, which explains some of the hard words, or calls attention to pairing contrast with the adjacent saying, or in some cases refers to longer explanations in the Appendices at the back of the book. That is what we have tried to do. But even that two-layer approach may not solve the problems, and it is quite possible that the ideal would be many different translations, each perhaps with a text plus commentary structure, but being aimed at readers of different interests and experience. The trouble is that this strategy leads to a very large number of near-duplicate books on the same subject, which is wildly impractical under any imaginable conditions. Still, we might some day do a shorter Analects book for the general readership, maybe not even including all the Analects passages, and explaining those passages more simply. If we get around to it. Which will not be this week, or this year. Q: Why do you decide to use the present romanization rather than the Wade-Giles or pinyin. I don't see in what way it is more "intuitively convenient" to readers. A: In making that choice, we had in mind precisely the general reader, the one who is making a first contact with Chinese words and ideas. The expert, or the native, don't need help; they already know how to pronounce the words. But what is the best kind of spelling for that beginning reader? That question is where we start, and we answer: In the English-speaking world (which is the one to which our translation is addressed), people have habits about the sounds they associate with the letters of the alphabet. The letters are not available to be arbitrarily reassigned. Any spelling system that violates those established habits will be intuitively difficult, and will lead to trouble. Both Wade-Giles and pinyin have been tried and found wanting in that role: they trick beginners into mispronunciations that could easily have been avoided. Pinyin fixed some of the worst features of Wade-Giles (such as the business with the apostrophes), but then it introduced new bad features of its own (such as the presumably Irish-based Quinn Dynasty). This sort of thing is not communication, it is mystification. Here's what we mean. Some years ago, the President of the United States made a formal diplomatic visit to China, and was of course prepared by his staff in advance, so that he could pronounce the names of the people he was going to meet. The trip was a huge embarrassment because the pronunciations were in fact wrong. We co-signed a letter to the New York Times, pointing out the nature of the problem, and its cure. By contrast, neither beginning students in survey courses nor high-level professional diplomats have any great trouble with Japanese names, and the reason for this is simple: the common (Hepburn) romanization for Japanese keeps to the lines of standard alphabetic equivalents. I can't think that China is well served by pinyin in this public dimension, or that professional Sinologists are doing themselves a favor by perpetuating it. They should rethink the whole position, in terms of public need and not private ingenuity. For readers needing to coordinate our more intuitive spelling with either of the old bad systems, there is a conversion table in the book, at p325 and following. (There are more elaborate, three-way tables at this web site, in the Reference section). Q: You have mentioned the previous translations by James Legge and Arthur Waley. How do you compare your version with the others? What are your prominent features and advantages? A: Legge and Waley are by far the most widely used English translations, and we wanted to be sure to address questions that might arise from readers familiar with those translations. (This is why we give the Legge numbering, which is not technically ideal, at the end of each passage of our translation). We also consulted several other versions, including Dawson and D C Lau in English, and Richard Wilhelm in German; perhaps a couple of dozen all together. Nearly all of them now and then got some points right that Legge and Waley, in our opinion, had missed. But these comparisons were done early in our long work on the Analects, and they were mostly done to check our understanding of the passages, not as contributions to our translation as such. Many translators like to distance themselves from other versions when actually making their own, and we did the same. We translated directly from the Chinese text, and when revising, we compared our version again with the Chinese, not with another English translation. So we have never actually made the systematic comparison you suggest. Legge: "The Master said, If a man take no thought about what is distant, he will find sorrow near at hand." Waley: "The Master said, He who will not worry about what is far off will soon find something worse than worry close at hand." Brooks: The Master said, If a man has no worries about what is far off, he will assuredly have troubles that are near at hand." There are no big differences there, but I think our version brings out the exact grammatical parallelism of the original (ywaen lw / jin you) a little more clearly than either of the others (Waley's "worry / worse than worry" is a parallel that is not in the original; it is an idea of his own). So also with the parallel and contrasting verbs wu and you, which we render as "has no / have." And the adverb bi (Legge "will," Waley "soon") seems to us more exactly rendered by our "assuredly," as describing an inevitable result. We explain in our comment that "far off" refers to the future; Lau conveys the same information by translating as "distant future." Again, we prefer to keep the interpretation as far as possible out of the translation and in the notes, but this is an area where individual tact and judgement apply, and though we think our translation is more precise, we understand why Lau rendered the passage as he did. Based on this one random sample (but with some support from several reviewers, including some who were not best pleased with our historical reconstruction of the text, but who found our translation to be both exact and elegant), I would have to say that we seem to have been successful in our primary attempt, which was to stay as close as possible to the thought, and also to the rhetoric and grammar, of the original. We invite the reader on p17 and following to be aware of the parallel structures, the sonority and weight, of the original Confucius sayings. We tried to be aware of them too, as we worked. The interlinear translation given on p17, which can there be seen to be very close to the structure of the original, is also almost identical to our final translation as printed on p13 and following. I don't think that any other translation has succeeded in getting closer to the original expressive structure. Q: In the course of your translation, have you also experienced a kind of anxiety of influence, or do you feel you are standing on the shoulders of giants? A: We very much appreciate the work of previous scholars, including several Chinese commentators who are also cited here and there in the notes. But no, we didn't feel anxiety that their work would unduly influence us, or that we were dwarfed by their accomplishment. The achievements of past scholars are encouraging, but so are their occasional errors, in that they assure the scholars of the present that there is still something left for them to do. 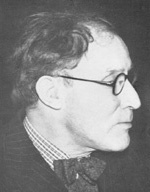 We find Waley fluent but sometimes periphrastic in expression (Waley himself admitted that his Japanese No Play translations sometimes seemed verbose compared to the later versions of Sam Houston Brock), and Legge is consistently insightful, but he is sometimes misled by his presumptions, or simply by the period in which he worked (Waley published several pages of corrections of Legge's Mencius translation). Scholarship should get better as it goes along, and we feel ourselves to be part of that progress. It is definitely work. You have to consider every single word of the text, in itself and in its connection to the rest of the text, and to the rest of the literature outside the text. But we have not found it frightening. To be honest, we have found it sort of fun. Q: What is your special difficulty in translating Lun Yu? The representation of its cryptic language style, the interpretation of its philosophical meaning, or something else? A: As mentioned, we made a special effort to keep the often parallel, and often gnomic (I would not say "cryptic") style of the original. We sometimes chose to abandon smooth English in so doing (see for example our note on the "than" construction, ap LY 9:12 and elsewhere; check the Index sv "rather than"). We think that our work in establishing the dating and nature of the text, and bringing each passage into its real-time conjunction with contemporary thought (whether in the Gwandz, the Mencius, the Mwodz, the Sywndz, or the Jwangdz) was of great value in properly estimating not only the philosophical, but sometimes also the political, meaning of each passage. 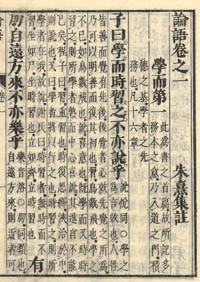 If one does not realize (as Waley, for example, did not) that LY 18:4-6 are addressing a whole series of challenges to the public service ethic by several of the Jwangdz writers (in he 03rd century), and that some of those Jwangdz groups responded to the Analects rebuttal by changing their own stance in a Confucian direction (as in JZ 4:1-3, which even feature Confucius and Yen Hwei as principal characters), then one simply does not understand what is going on. To work out the chronology of the Analects, and of all the other major pre-Chin texts, was difficult, but in our opinion it gave to our work its other important virtue, besides its closeness to the language and expression of the text, and this is its accuracy in rendering the situation, what the Germans call the Sitz im Leben, of the text. 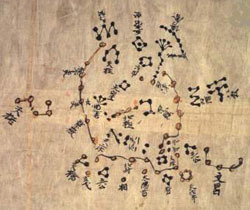 The historical connectedness of the Analects to its own time, or times. Q: One last question concerning translation: Do you think of a translator of a (philosophical, historical, religious, etc) text should also be an expert in the particular field so that the translation can become a perfect combination of language transference and academic research? A: Probably nothing a translator knows is wasted. But I think it is a mistake to categorize each text as having only one quality, and then to think of it as requiring to be translated by an "expert" in that quality. The translator of, say, the Gwandz has to know something about law, something about land measurement, something about calendrology, something about the technique of meditation, and a good deal about economics, warfare, and what I might call social engineering. And a lot about the political and social conventions of the time, such as the range of rhetorical devices available to an advocate in the 04th century (and those available in the 03rd century, and the two lists are not the same). Are we going to find such a finished expert in one person? I don't think so. I think that the job needs, above all, a translator, someone practiced in expressing the thought of one language in the words of another. One can learn the cosine rule, if that is necessary for a particular job of translation, in thirty minutes. Skill and depth in handling two languages, each in its own terms, might require thirty years. Which skill, then, is prerequisite, and which can be made good later on if necessary? ". . . and he read the first draft of my translation of the fragments. At the time I considered [Shvn] to be a very interesting administrative technician, but no more. Muhsin insisted that he was an important political philosopher, and that I should investigate him as such. He was, of course, quite correct." Another learning experience for Creel. The point is that he survived it. We can survive it too, and the experience is even to be welcomed. However experienced we may be, and professional translators in industry have told me that they have experienced the same sort of learning on the job, we should somehow not emerge from a translation knowing no more than we started with. When all is said, translation is probably the closest kind of contact that we can make with a work in a foreign culture, and thus with an entire foreign culture as it affects or is reflected in that work. It needs learning, and for that reason, it confers learning. We should above all be willing to learn.